We’d love your help. Let us know what’s wrong with this preview of Forget You Know Me by Jessica Strawser. Jessica Strawser's Forget You Know Me is a “twisty, emotionally complex, powder keg of a tale” (bestselling author Emily Carpenter) about the wounds of people who’ve grown apart. Best, friends, separated by miles. Spouses, hardened by neglect. A mother, isolated by pain. To ask other readers questions about Forget You Know Me, please sign up. Who is the masked intruder? Three books in and Jessica Strawser continues to impress—transitioning from new author, riding high on my radar, to landing a spot among my favorites. There’s a realness and fluidity to her writing style, qualities that speak directly to my reader’s heart. Strawser has taken a bit of flak for the miscategorization of her novels—mostly from readers under the assumption her work resides in the suspense genre, for one reason or another—which somehow feels unfair. So, let’s take a minute to clear th Three books in and Jessica Strawser continues to impress—transitioning from new author, riding high on my radar, to landing a spot among my favorites. There’s a realness and fluidity to her writing style, qualities that speak directly to my reader’s heart. Strawser has taken a bit of flak for the miscategorization of her novels—mostly from readers under the assumption her work resides in the suspense genre, for one reason or another—which somehow feels unfair. So, let’s take a minute to clear the air. Similar to her two previous novels, Forget You Know Me is women’s fiction with a very slight edge of suspense, not a thriller. Regardless of what you might glean from the blurbs floating around, you won’t find a true suspense novel within these pages, no matter how you approach it. What you’ll find instead, a three-dimensional cast ready to ensnare readers with their relatable relationship woes and full gamut of emotions. The heartbeat of this story is the exploration of relationships—from the perspective of marriage, friendships and siblings—and the very real notion that it takes effort from both sides to maintain a bond. No matter how hard we try to avoid it, sometimes relationship change. Time and distance leads to space and that closeness slips away. People move on. We no longer know one another the way we once did. For Molly and Liza, it was a no-brainer—best friends since childhood—they would always be each other’s number one. Always. Well, until Molly’s marriage to Daniel and the addition of their two children to the mix. Followed by Liza’s urge to start over somewhere new, putting Cincinnati in her rearview, and Chicago on the horizon. Chicago also meant the addition of lovable Max, Liza’s everyday bestie. Glasses of wine shared over Skype, dubbed “girls night”, starts the true unraveling of Molly and Liza. It’s been a while since they’ve taken the time for one another, meaning things start off on somewhat of an awkward note. When they cut through the phoniness and really start to reconnect, it’s Molly’s daughter that puts things on hold. “Sitting” in Molly’s living room alone, waiting for her to return to the screen, Liza sees a masked intruder enter her friend’s house, inciting mass panic on her end. So, why is it that Molly gives Liza the brushoff later—via text of all things—insisting everything is fine? And why does she practically slam the door in Liza’s face the next morning after she drives through the night on a hunch that something just isn’t right? Ok, I know what you’re thinking . . . a masked intruder?! Yes, it’s one heck of an opening, but again, this is not a thriller—so, let those thoughts go. And prepare to focus on the people at hand, instead. Molly, Daniel and Liza take over, each telling their version of how they ended up here. For Molly and Daniel it’s a lonely marriage haunted by resentment and years of pain. For Liza, it’s the loss of her best friend for reasons unknown and the longing to return to Cincinnati, even if it feels like a failure somehow. It’s a battle of hurt, ego and turning elsewhere for comfort. Is it ever too late to get back what you once had? I think it’s probably fair to say we’ve all experienced the loss of a close relationship at one time or another, which is what makes this novel so fascinating. With her writing prowess Jessica Strawser delivers an emotionally charged look at the lengths some of us will go to start over, to once again have that person close. While this is nowhere near what I would consider a fast-paced novel, I found myself so enraptured with the characters—especially Liza and her battle with fate vs. luck—I couldn’t bear to set it down. Meaning, I spent the better part of a day devouring a book I had planned to savor. Fingers crossed Ms. Strawser is hard at work on her next release. I'm between 3 and 3.5 stars. Liza and Molly have been best friends since childhood. Even when Molly was dating, and then married, Daniel, Liza was still a part of their lives, sharing stories of disastrous dates and her real lack of ambition. But when Liza moved from Cincinnati to Chicago for a job, it put a real strain on their friendship, and that strain began working its way into Molly and Daniel's marriage as well. But one night while Daniel was on business travel, Molly and Liza are determine I'm between 3 and 3.5 stars. But one night while Daniel was on business travel, Molly and Liza are determined to remedy their lack of connection. Once Molly's kids are asleep the two settle down to a long Skype chat, complete with wine. For a few minutes, things seem like they used to—and then one of the kids begins crying for Molly. While she attends to her daughter, Liza finds herself staring at the blank computer screen...and then suddenly she sees a masked man, dressed all in black, come into the frame. Liza screams for Molly, tries calling her cell phone, but the intruder closes the computer screen. Liza is at her wits' end. She is in a panic, constantly trying to reach Molly, and then eventually calling 911 to see if they can make sure everything is okay. But when Molly finally responds—via text, no less—her replies are curt, leaving Liza confused. Suspecting something more complicated is occurring, Liza decides to drive to Cincinnati to see Molly herself, but after driving all night, she is sent away following an angry confrontation that Liza doesn't understand at all. Meanwhile, Daniel, who returned early from his business trip, doesn't understand why Molly didn't even call him about the intruder, nor can he figure out why Molly would have sent Liza away with such anger. What is she hiding from him? He's curious to know, although he isn't without secrets of his own, secrets which could upend all of their lives. When Liza returns home and discovers she narrowly avoided a brush with disaster, it sends her into a tailspin when coupled with the apparent dissolution of her and Molly's friendship. She's still determined to find out what Molly is hiding from her, but she also needs to pull her own life together, as everything seems to be spinning out of control. I had been under the impression that Forget You Know Me was a thriller, but while it has a tension-filled, pulse-pounding start, it becomes an exploration of the stresses, the secrets, and the lies that threaten to tear our relationships apart. It's a book about marriage and friendship, of fear and bravery, of giving voice to the things that threaten to destroy us. While many of the problems facing the characters become obvious, the mystery of the masked man lingers, although many may figure out his identity. For me, it almost was a distraction once it became apparent that the book wasn't really focused on that incident as much as everyone's problems. At times I felt that the book wasn't quite sure what it wanted to be, and I wondered whether one incident in Liza's life would wind up coming back into the plot as well. I like the way Jessica Strawser writes, and really enjoyed her last novel, Not That I Could Tell (see my review), which was released earlier this year. I didn't feel that this book was as strong, because the characters aren't all that likable, and because I really didn't know what to expect from the overall story. However, even though it was a tiny bit slow at times, I couldn't stop reading it, because I needed to know where she was going to take the story. Once you understand this isn't a thriller, you may be able to enjoy the book for its storytelling, and for the twists and turns Strawser throws in. She's definitely a talented writer, one who can take ordinary situations and turn them into drama. Forget You Know Me is a lovely examination of relationships and different types of love. Following multiple perspectives, this 'domestic drama', tracks a set of adults as they navigate the tricky art of making long-term relationships work. The book starts off with a bang: BFFs, Liza & Molly, who have grown apart in recent years, decide on a Skype date to play catch-up while Molly's husband is away. As Molly dashes away momentarily to check on her children, the computer continues to stream her Forget You Know Me is a lovely examination of relationships and different types of love. Following multiple perspectives, this 'domestic drama', tracks a set of adults as they navigate the tricky art of making long-term relationships work. The book starts off with a bang: BFFs, Liza & Molly, who have grown apart in recent years, decide on a Skype date to play catch-up while Molly's husband is away. As Molly dashes away momentarily to check on her children, the computer continues to stream her surroundings. Liza sees a stranger enter but has no way to warn Molly of his presence. As you can imagine, she panics. Her resultant actions set up a string of events that catapults the action of the rest of the book. The first chapter really sucked me in. I was hoping it would keep up that atmosphere and pace but it tapered off for me after that. A creepy thing happened and we just sort of moved on. In the end, all was cleared up but, again, for me, the ending was just okay. It was a good book, for sure, but I don't anticipate lying awake tonight thinking about it. I did really enjoyed Strawser's writing style and absolutely plan to read more of her books. The prose is well-thought out and rich in detail. As far as the characters go, they were all very well developed and we spent a good amount of time learning the main characters thoughts, past and motivations. I would recommend this to anyone who enjoys contemporary literature, especially those that revolve around the complications that can arise within adult relationships. 4.5 rounded up. This novel starts out with a bang when two friends who have been growing apart are trying to reconnect via Skype. When Molly goes to check on her daughter, leaving her laptop open and on, Liza sees a masked man enter her friend’s house. Naturally, Liza loses her mind, calling the police and her friend over and over to no avail. Imagining her friend has been kidnapped—because why else wouldn’t she answer her phone or call Liza back?—Liza leaves Chicago, the city she relocated to t 4.5 rounded up. This novel starts out with a bang when two friends who have been growing apart are trying to reconnect via Skype. When Molly goes to check on her daughter, leaving her laptop open and on, Liza sees a masked man enter her friend’s house. Naturally, Liza loses her mind, calling the police and her friend over and over to no avail. Imagining her friend has been kidnapped—because why else wouldn’t she answer her phone or call Liza back?—Liza leaves Chicago, the city she relocated to two years earlier, and hightails it back to Cincinnati to check on Molly. I can’t tell you what happens next without giving away major plot points, so I’ll simply say that while this is a mystery/suspense novel (who was that masked man?! ), it’s also about friendship and marriage and the challenges of nurturing relationships over time, distance, and other obstacles. Thanks to NetGalley and St. Martin's Press for the opportunity to review this novel, which RELEASES FEBRUARY 5, 2019. Molly and Liza have been close friends for a long time, but distance and life seemed to have gotten in the way. The two friends decide to have a video chat over wine to catch up and things are going great until Molly goes in the other room to check on her daughter. Liza, while waiting for Molly to return, notices a masked intruder walk across the room. Naturally Liza is concerned, she is more than concerned she is freaked out. Who wouldn't be? She makes attempts to contact her friend and calls t Molly and Liza have been close friends for a long time, but distance and life seemed to have gotten in the way. The two friends decide to have a video chat over wine to catch up and things are going great until Molly goes in the other room to check on her daughter. Liza, while waiting for Molly to return, notices a masked intruder walk across the room. Naturally Liza is concerned, she is more than concerned she is freaked out. Who wouldn't be? She makes attempts to contact her friend and calls the authorities. When she finally contacts her friend the next day, she is stunned by her friend’s icy reception which ends with anger and hostility. The opening of the book is strong and instantly grabbed my attention. Molly's reaction to Liza being concerned had me scratching my head. Just what the heck is going on? When Liza returns home, she gets another shock. Then there is Daniel, Molly's husband who was away on a business trip and is concerned when his wife fails to mention an intruder being in their home. Ummm... that is huge, why not mention it? Sure, their relationship has been strained and over the years, they too have had some distance come into their relationship as hurt, resentment and lack of communication crept into their lives. It is obvious that there is more going on than meets the eye. The opening scenes along with the book description may make this book look like a thriller but it is really a look at relationships and how relationships can become distant, lonely and lose their luster. It shows how lack of validation in a relationship can damage it. How people want to be acknowledged, heard and respected. It also shows the effects of secrets and how one act of bad judgement, once committed begins to snowball until one is making one poor decision after another. It's a look at what happens when you get in over your head and you don't ask for help. Relationships. Love. Distance. Secrets. Resentment. Guilt. Intruder. After the intense beginning, this book slows down and has a slower pace as it explores the relationships of the main characters. Strawser is a gifted writer but even with her great writing, this one just didn't blow me away. Having said that, I did enjoy this book -especially how the Author showed how sometimes life gets in the way and individuals need to make time for their relationships. Friendship is important. Making time for those in our lives is important. Communication is important. I enjoyed Liza but found that I never warmed to Molly or Daniel as I would have liked. I really enjoyed Strawser's other book "Not that I could tell" and had high hopes for this one. For me this was just a little too slow. I would advise everyone to keep in mind that this book is about friendships, marriage, relationships, choices, secrets and lies. It's a slow burn which is satisfying but if you are looking for a lot of action, you may be disappointed. This was a solid 3 star read for me. . Thank you to St. Martin's Press and NetGalley who provided me with a copy of this book in exchange for an honest review. All the thoughts and opinions expressed in this review are my own. I think we’ve all experienced a video chat/ FaceTime, where the other person is just a bit off camera...maybe you get a good shot of the top of their head, or their ear. Maybe even the ceiling! But what if in the middle of this particular chat you witnessed a crime! A burglar breaking into the house! That’s what happened when Liza was finally video chatting with her friend Molly. While Molly leaves the room momentarily to tend to her children Liza watches, shocked as a masked man enters her friend’s house! Only Molly downplays it as though nothing happened. Not even bothering to mention it to her husband! Bit odd, don’t you think? There just has to be more to the break in....right!? This is the second book I’ve read by Jessica Strawser. I thoroughly loved Not That I Could Tell and was hoping this would be equally gripping and riveting, but for me it wasn’t. From the start I had a hard time connecting with any of the characters. And as the storyline unfolded I just wasn’t able to keep up. Just not a good fit for me. Of course that won’t stop me from looking for Ms. Strawser’s next release! I really enjoy this author and wanted to love this one, but honestly, I was not wanting to pick up the book throughout reading it. The beginning was so intriguing and I was hopeful that the story line would be suspenseful. It wasn't and I didn't feel anything for the characters. The twist was not surprising or thrilling. I can't figure out why the novel started one way and swerved off on so many detours. I feel like it was trying to hard to be several genres, but t This did not work for me at all. The beginning was so intriguing and I was hopeful that the story line would be suspenseful. It wasn't and I didn't feel anything for the characters. The twist was not surprising or thrilling. I can't figure out why the novel started one way and swerved off on so many detours. I feel like it was trying to hard to be several genres, but that was just my take. There are many positive reviews. Themes of relationships, troubled marriage, and making sense of it all. Molly and Liza are the best of friends. Molly eventually marries Daniel, and the two remain close. Things change when Liza moves away, though. It affects her friendship with Molly and also Molly’s marriage. But why? Daniel is away on business, and the friends plan a video call to catch up. Molly leaves the room briefly, and Liza sees something that has her driving all night to Molly’s house. When she arrives, Molly is cold, and Liza is confused. Did Liza really see what she was so concerned about? Is their friendship over? The premise of friends growing apart after marriage was relatable and well-rendered. The characters are cast in three-dimension; this truly is a character-driven story. It’s also the story of marriages that grow apart, which again, is another relatable topic. How do you stop, can you stop, that inertia when you finally realize the distance is growing? If you’ve been knee-deep in either of these dynamics on a personal level, this book will resonate. I enjoyed watching Liza and Molly process their situations and was enamored with the insightful way this story was told. Well-done, Jessica Strawser! Life... it is messy, it is uncomfortable, it is tough... Jessica Strawser Does an amazing job of making her characters pop off the pages, there is an authenticity to her characterization and storytelling... this is an exquisitely told domestic drama with a sprinkle of suspense... it is NOT A THRILLER ...and I think if you start this book with the expectation that this is a wonderful exploration of the dar A real, raw, and riveting story about the good, the bad, and the ugly side of life and love! A book that takes an in-depth look at the breakdown of both marriage and friendship... how insecurities and fears can lead to lies and secrets that ultimately lead to hurt and betrayal.... all these characters were very real, flawed, and relatable, however not always likable... I have to admit I found Molly insufferable at times or chronic pain frustrated even made the reader, meanwhile I really liked Liza and enjoyed her entire storyline immensely... this is not to say I did not like Molly and her story, I just found that story much more frustrating, Daniel and she needed some serious marriage counseling.... but even my frustration with these characters added to the authenticity of the story, as I mentioned life is messy.... just so many things I loved about this book, I found it fascinating how Liza dealt with her survivors guilt... I enjoyed the bond between little Rosie and Nori... and the sweet romance between Liza and Henry put a big smile on my face, what a wonderful man he was! My new novel, coming in February 2019: Can't wait to share it with you all! Liza and Molly have been friends since childhood. Though they now live in different states they try to check in whenever time permits. One night, while on a video chat, Liza sees a masked man intruding in Molly’s home and calls the police. When confronted, Molly pretends like nothing happened. Thereafter things get stranger and stranger. Was a masked man in Molly’s house? And if so, why is Molly poo pooing the idea? “Forget You Know Me” is the third book I’ve read by Jessica Strawser and sadly, it fell short of my expectations. I found it to be both a bit confusing and slow from the start. That said, I really liked the characters of Liza and her friend Max and wish they had been the main focus. This was a buddy read with Kaceey. Thank you to NetGalley, St. Martin’s Press and Jessica Strawser for an ARC of this novel in exchange for an honest review. Published on Goodreads and NetGalley on 12.30.18. My first experience reading Jessica Strawser, and I can now understand the buzz in the book community over her work! I found Forget You Know Me to be decadent, raw, and emotionally gratifying. This is a book most women will connect with, especially as we transition out of youth and into adulthood. It touches on friendship, love, marriage, finding yourself, and coping with life in the best ways we can. And it has quite a tangled storyline to draw you in! I’m left feeling so fulfilled by this book My first experience reading Jessica Strawser, and I can now understand the buzz in the book community over her work! I found Forget You Know Me to be decadent, raw, and emotionally gratifying. This is a book most women will connect with, especially as we transition out of youth and into adulthood. It touches on friendship, love, marriage, finding yourself, and coping with life in the best ways we can. And it has quite a tangled storyline to draw you in! I’m left feeling so fulfilled by this book—something that I don’t always feel leaving a reading experience. The perfect combination of closure and hope! I had the benefit of the book besties here, letting me know upfront that Jessica Strawser books are truly women’s fiction, though they often are placed in “mystery and thriller” categories. So going in I expected a fantastic domestic fiction novel with elements of suspense, and that is exactly what this book is. Think Sally Hepworth, for those of you who have read her. Or even Liane Moriarty. I make those comparisons purely in the genre, because I think Jessica Strawser’s voice is incredibly unique, and I don’t like to set readers up to expect a specific writer when they have their own characteristics. Strawser’s writing style is so fluid and beautiful. I highlighted several passages to go back and read again, because there is a very poetic quality to the way she writes. Even the subtlest of reflections a character has on the weather, for instance, carry so much meaning for the story. This is a book to savor and read slowly. There is so much emotion and history and nuance packed into every single paragraph. Strawser is truly brilliant! Molly and Liza’s friendship felt so familiar—I think so many women will connect to that storyline. As the book begins, both are trying to reconnect without admitting that’s what they are doing. They’ve lost touch. Molly got married and had kids, and Liza moved to Chicago for a job and is on the dating scene. Though they are a 6 hour drive apart, the emotional distance feels so much longer. They are in such different places, and they’ve lost their connection that they’ve had since childhood. Then there is the relationship between Daniel and Molly, a marriage that is built on so much love, but now feels fraught with resentment. Chronic pain experienced for years by Molly, but not properly acknowledged by Daniel. A feeling from Daniel that Molly has slipped away. That she isn’t the person she was when they met. And that maybe, he is partially to blame for this. They both have secrets from each other, and they are too afraid to tell them. But they also love one another so deeply. They want to fight for each other, but they also don’t know how. Lisa is lost as well, but in a different way. Liza hasn’t lost who she is the way Molly has, but she’s lost her purpose. She’s fighting a battle for something she isn’t even sure she wants. In the same way Molly retreats when she becomes anxious, Liza pushes even harder. So when Liza and Molly are on their skype call for “girls night”, and Liza witnesses something she was never meant to see, she panics. She calls the police, and tries to call Molly back. But Molly brushes her off. Liza can’t shake the feeling something is wrong. Driving all night, Liza is worried. But when she arrives at Molly’s house, Molly turns her away. Her message is clear—forget what you saw; forget you know me. I think more than anything this is a book about what goes unsaid. The things we bottle in until they are almost too much to let out. How we let things spiral out of control, and hide them from the world. How we struggle to acknowledge how bad they’ve gotten to ourselves. How sometimes being honest with those you love most is the hardest thing of all. And ultimately, how every burden is so much easier to carry when you finally do share it. The entire book was so wonderful for me. I think fans of women’s fiction are going to be blown away by this story. It has just enough suspense to keep my mind whirling, but it really is ultimately about the relationships in the book and the characters. And I truly loved every single character! I can’t wait to read more from Jessica Strawser. Forget You Know Me by Jessica Strawser is a women's fiction novel with a hint of suspense... not a thriller at all. Before starting this book, I kept seeing reviews about the disappointment with this not being a thriller. What you find behind this pages is more of a character driven novel about relationships, challenges of life, marriage, and friendships. What I love about Strawser's story here is how relatable it can be to anyone. 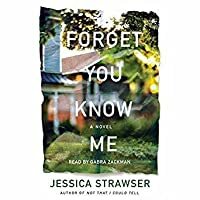 Strawser dives deep into the depths of relationships in this one Forget You Know Me by Jessica Strawser is a women's fiction novel with a hint of suspense... not a thriller at all. What I love about Strawser's story here is how relatable it can be to anyone. Strawser dives deep into the depths of relationships in this one. How relationships can change over time or as two individuals grow apart from one another. It takes effort to maintain that bond between one another and sometimes as we don't like to see that relationships can fade in time. Molly and Liza have been friends since they were young. The plot is mainly focused on the relationship of these two women and how the strain/distance of their relationship occurred over time. "Forget you Know Me" is a significant title to the book and makes you think about what it truly means as we all grow/change over the years. Are we meant to have the same people in our lives forever? Strawser is such a talented author but I struggled with this novel. It was very very slow and I wasn't particularly entertained. I was hoping for more action and this was a bit of a disappointment for me. This was a solid 3 stars for me. Thank you to Netgalley and St. Martin's Press for the arc in exchange for my honest review. Molly’s husband is away on business and her two young children have been tucked into bed. She and her oldest friend Liza have planned a “Girl’s Night”, or the closest thing to it, being that Molly still lives in Cincinnati and Liza in Chicago. A long overdue, video chat, with a goal of reconnecting...of bridging the distance that has come between them over the years. The wine has been poured, and the chat has begun but Liza can tell that Molly’s smile seems forced...a little too bright, a little Molly’s husband is away on business and her two young children have been tucked into bed. The wine has been poured, and the chat has begun but Liza can tell that Molly’s smile seems forced...a little too bright, a little bit too polite. But before Liza can delve too deeply into what she is perceiving, one of the children calls out to her mother. As Molly goes upstairs, to check on her crying child, a man in a mask enters the room. Startled, Liza calls out..alerting the man that he is on camera and telling him she is calling the police. The video chat is shut down. Frantic, Liza attempts to call her friend repeatedly and when she cannot be reassured that Molly is okay, she drives through the night to check on her. But instead of gratitude, the greeting she receives is icy. As if she has overreacted. What transpires next is the kind of women’s fiction that I enjoy most. Well developed characters dealing with “real life” issues of friendship, marriage and family. Imperfect. Sometimes disappointing. Sometimes hopeful. I have had friendships end, some by circumstance, and some by choice, and I am definitely not the same version of myself that I was 10, or 20 years ago. I may be version 4.0 by now!! A “masked man” may have entered the house, and started a chain of events, but he wasn’t the only one wearing a mask. Molly and Liza had been friends since childhood and although they now live in different states they still try and stay in contact as much as they can when they both have time to spare. One night they decide to hold a video chat once their kids are in bed as it’s been a while since they’d caught up with one another. During the video chat, Molly leaves the room as she needs to see to her crying child. Whilst Molly is absent, Liza sees something that leaves her very worried and distressed, but what Molly and Liza had been friends since childhood and although they now live in different states they still try and stay in contact as much as they can when they both have time to spare. One night they decide to hold a video chat once their kids are in bed as it’s been a while since they’d caught up with one another. During the video chat, Molly leaves the room as she needs to see to her crying child. Whilst Molly is absent, Liza sees something that leaves her very worried and distressed, but what can she do when she lives so far away? This story grabs your attention right from the start and immediately you want to know what’s going to happen next. Sadly the suspense stops just after that and I found the story began to drag and I became uninterested which is not what you want in a thriller/ suspense novel. Of course, this is only my opinion as I’m sure there will be many people who have and will love this book. So if you enjoy reading this genre please give it a go and make up your own mind. Forget You Know Me by Jessica Strawser is more of a domestic drama than a thriller of a story as much as the idea behind the story sounded thrilling. Told from different points of view the story became more about friendships, relationships and the characters lives. Molly and Liza have always been the best of friends and even used to laugh and claim that others weren’t true friends if they could let anything come between them. But with Molly getting married and Liza moving to another city the two Forget You Know Me by Jessica Strawser is more of a domestic drama than a thriller of a story as much as the idea behind the story sounded thrilling. Told from different points of view the story became more about friendships, relationships and the characters lives. Molly and Liza have always been the best of friends and even used to laugh and claim that others weren’t true friends if they could let anything come between them. But with Molly getting married and Liza moving to another city the two have been growing apart. Molly’s husband, Daniel, needs to go away on business so Molly thinks it would be the perfect time to connect over Skype with Liza. As every parent knows though the best plans can always be interrupted by a child so as Molly walks away to tend to her children Liza is left waiting. Before Molly makes it back to the computer though Liza sees a masked intruder and calls the police but when nothing is found Molly seems almost angry with Liza. Forget You Know Me is actually the third book I’ve read by Jessica Strawser and having loved the first two I had high hopes for this one. I did find the same writing style that pulled me right into the book but after a while this one just seemed to begin to drag along. It’s not a bad story really but I was expecting the drama angle to it instead of an intense thriller. While this one wasn’t as good as the first two in my opinion I will definitely be back to try another from the author in the future. Let’s get this out of the way from the start: just like her previous novel, Jessica Strawser’s newest work Forget You Know Me is once again WRONGLY labeled as being of the “mystery/thriller/suspense” genre when it should more accurately be placed in the “women’s fiction” or “contemporary fiction” categories. I’m not sure if Strawser’s marketing team is the one mis-categorizing her books or perhaps she originally did intend to write a suspense / thriller novel but it didn’t end up working out that way. Regardless of reason, the important thing is to NOT go into this book expecting a thriller -- or even domestic suspense for that matter -- because the book definitely won’t deliver on either front. Just like with her previous 2 novels (her debut Almost Missed You as well as her sophomore novel Not That I Could Tell ), Strawser starts off her story with an “explosive” scenario – in this case, it is one of the main characters Liza video-chatting with her best friend Molly one night while her husband is away on a business trip, when Molly steps away to tend to her kids and suddenly, through her laptop’s webcam, Liza sees a masked intruder entering Molly’s house. The screen goes blank and when Liza’s attempts to confirm Molly’s safety prove unsuccessful, she makes the rash decision to drive hours across state lines (Liza is in Chicago, Molly is in Cincinnati) to check on her, only to have her best friend be annoyed by her unexpected appearance and subsequently slam the door in her face. Angry and saddened, Liza returns home to Chicago, only to find out that she is about to have a “near miss” of her own. Reading the first chapter with the above opening, plus the vagueness of the summary describing the book itself, I can see where the misunderstanding of this being a suspense / thriller may possibly come from. Despite the “shocking” incident that opens the story though, it is apparent a few chapters in that the incident serves merely as a catalyst to jump-start the story – after that, it becomes “background noise” of sorts, a plot point placed on the back burner in order to make way for the real plot: mostly a character-driven exploration of relationships, marriage, family, friendship, and just how badly lies and secrets can drive even the closest of friends and family apart. One of Strawser’s talents as a writer is her ability to draw up realistic portrayals of characters whom we can all relate to in one way or another – characters who are flawed and vulnerable and often dealing with issues that ordinary people face on a near daily basis. Going deep into her characters’ minds and giving us a thorough understanding of their thought process and rationale, we get to know Strawser’s characters intimately, though I will admit that with this particular book, it goes a little too deep in the sense that at certain points, it felt like some of the characters were overthinking and overanalyzing their situations a bit too much. This made the story a bit tedious to read at times, as some parts seemed to ramble on a bit unnecessarily. With that said though, I still enjoyed the book overall and the topics explored did leave me with some “food for thought” afterwards, which is always a good thing when it comes to my reading. This is the third novel of Jessica Strawser’s that I’ve read and though none of her 3 books thus far have made it to my favorites list, I still enjoyed reading each one. I like the way Strawser writes and also the strength of her storytelling, which manages to keep me engaged and interested in the story even though there might not be much going on in it. This is an author whose books I know I will continue to read and look forward to each new release. ...A strong startling beginning exposing a masked intruder (no spoiler here) sparked my interest, but my attention quickly waned as the storyline redirects the fear of what's about to happen to a wordy mediocre work of women's fiction surrounding a troubled marriage and broken friendship with too many unnecessary side stories. ...I grew bored with Molly and Daniel posthaste, but enjoyed Liza's story, her relationship with Henry, the pilot and the excellent plot connection to her near miss life threatening experience. ...Overall though, FORGET YOU KNOW ME was a bit of a tedious read (for me), but does peak my interest to where Jessica Strawser might go next....perhaps a true thriller. Many thanks to NetGalley and St. Martin's Press for the arc in exchange for an honest review. Special thanks to the publisher and to NetGalley for a free, electronic ARC of this novel in exchange for an honest review. Molly and Liza have friends for years. Even when Molly got married and Liza moved away, the two have retained their strong bond. One night, during a video call, Liza sees an intruder in Molly’s house and, worried for her friends’ safety, she drives all night to ensure her friend is not in danger. However, Molly seems almost put out by Liza’s unexpected arrival, claimin Special thanks to the publisher and to NetGalley for a free, electronic ARC of this novel in exchange for an honest review. Molly and Liza have friends for years. Even when Molly got married and Liza moved away, the two have retained their strong bond. One night, during a video call, Liza sees an intruder in Molly’s house and, worried for her friends’ safety, she drives all night to ensure her friend is not in danger. However, Molly seems almost put out by Liza’s unexpected arrival, claiming all is well and practically slamming the door in her face. Liza is convinced their friendship is over, but when other secrets are revealed and Liza has a close call of her own, both Liza and Molly are left with no one but each other to uncover the mystery. “Forget You Know Me’ is the third novel by author Jessica Strawser. I was a huge fan of “Almost Missed You” and although I have not yet read “Not That I Could Tell”, I heard great things. “Know Me” is an entertaining women’s fiction novel, which, heads up, is not my favourite genre. I found the writing to be creative and of course, Strawser is talented, but I was not engaged by this novel. The plot was slow moving and the novel itself was one of those “daily life” stories, where we hear about what Liza and Molly ate for breakfast or spent their day, instead of focusing on the mysterious stranger and its implications. Liza was a wonderful character, and I thoroughly rooted for her the entire way and although I was not a huge fan of Molly at first, she grew on me as I began to understand her motivations and flaws. The fact that this novel did not have many characters was a huge draw, as the plot was not difficult to follow. The friendship between Liza and Molly was the basis of the book. How the two met, how they have grown apart in recent years, and the drastic events that bring them together now. “Know Me” speaks to the realities of an adult female friendship, torn apart by relationships and distance, and the challenge it takes from both parties to maintain its importance. This aspect of the plot is obviously relatable, and the challenges are depicted honestly and openly, showing both parties as being mutually responsible for the slow drift of the friendship. I would’ve preferred more action and drama, as opposed to daily life adult struggles (I get enough of that in my own daily adult life) but the novel itself was entertaining, and Strawser is definitely a top notch writer. More mystery and suspense and this novel would’ve been my exact cup of tea, but fans of women’s fiction will eat up this novel. I can’t help but read Strawser’s works, as I am always wowed by her writing chops, but I do look forward to a little more excitement in her next one. I received a free e-copy of Forget You Know Me by Jessica Strawser from NetGalley for my honest review. Liza and Molly have been friends for their entire lives. They remained very good friends even through marriage and raising children but raising children, of course, took some of the time they spent off their friendship. One day, while video chatting, the girls are talking but Molly has to leave the computer screen to check on the kids. Suddenly Liza sees an intruder in Molly's house. 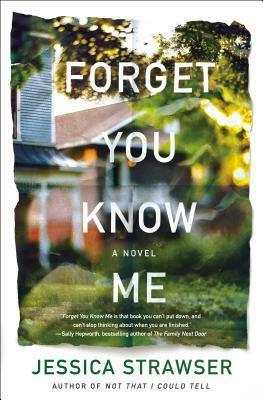 Lisa, terr I received a free e-copy of Forget You Know Me by Jessica Strawser from NetGalley for my honest review. Liza and Molly have been friends for their entire lives. They remained very good friends even through marriage and raising children but raising children, of course, took some of the time they spent off their friendship. One day, while video chatting, the girls are talking but Molly has to leave the computer screen to check on the kids. Suddenly Liza sees an intruder in Molly's house. Lisa, terrified calls the police. She also decides to get in her car, with her friend, Max and go to Molly's house to check on her. Molly's husband, Daniel, isn't in town when all of this happens and doesn't find out until the next day, when he came back home. When Liza arrives at Molly’s house, she is greeted by Molly and things get weird. Molly tells Liza that she over-reacted and to go away. The story gets a bit weird after that as it is based more about two friends, their secrets, lies and struggles in life and how damaging those secrets can be that can make everything spin out of control. This was a book of intrigue but I wouldn't consider it a thriller. A good book but I was hoping for a bit more action. Good writing and good characters. As I sit here having just finished Forget You Know Me, I find myself struggling to write this review. This is my 2nd book by Strawser and this one just didn’t QUITE do it for me. Without getting too far ahead of myself, the last 30% or so is what saved this book for me and earned its 3 star rating. The blurb sounded great and the beginning started off with a bang with what we find out the Liza witnessed, but in the end, that event really didn’t have much to do with the story. This is a story abo As I sit here having just finished Forget You Know Me, I find myself struggling to write this review. This is my 2nd book by Strawser and this one just didn’t QUITE do it for me. Without getting too far ahead of myself, the last 30% or so is what saved this book for me and earned its 3 star rating. The blurb sounded great and the beginning started off with a bang with what we find out the Liza witnessed, but in the end, that event really didn’t have much to do with the story. This is a story about a broken marriage, love and friendship- all the makings of a great women’s fiction novel. But I felt that there was too much disconnect as to what this book is being marketed as and what this book is really about. I found it a bit draggy and there is just SO much going on here, with Liza, Molly and Daniel. Maybe a little too much going on. It was slow and confusing at times, and I often wasn’t sure who the narrator was at the beginning of each chapter until I was a few sentences in. However, once all of the issues started to pick up steam on resolutions, the book started to pick up the pace and I found I that I quite liked the ending. I will definitely be keeping my open for more to come from Strawser, because she can definitely tell a story. Liza and Molly, long time best friends, who have grown apart, set up a video chat so they can catch up with each other, during which Liza sees a masked intruder enter Molly's home. The fallout from this event leads to exposing major problems in the marriage of Molly and her husband Daniel. Molly and Daniel have been keeping secrets from each other for years and with all those secrets, the intruder could be any number of people. Still, this isn't a search for the intruder but instead a character Liza and Molly, long time best friends, who have grown apart, set up a video chat so they can catch up with each other, during which Liza sees a masked intruder enter Molly's home. The fallout from this event leads to exposing major problems in the marriage of Molly and her husband Daniel. Molly and Daniel have been keeping secrets from each other for years and with all those secrets, the intruder could be any number of people. Still, this isn't a search for the intruder but instead a character study about how two best friends can have grown so far apart and how a marriage that seemed to start out so well, could become so dead. Liza, the concerned friend, who that same night, loses everything she owns, is a likable and sympathetic character, during an extremely upsetting time in her life. Molly, who suffers from chronic pain and health problems, is an angry, bitter women who has gone to dangerous extremes in order to find help for her pain. Her husband Daniel has his secrets at home and at work, although he appears to be putting in a real effort to mend his relationship with Molly. Both Molly and Liza spent an enormous amount of time overthinking things and their overthinking affects their lives in detrimental ways. I actually enjoyed reading about the side characters of Max, Henry, and Rick more than reading about Molly and Daniel. Hard to believe these two disconnected people could have such witty children and I spent a lot of the book feeling sorry for the kids and for Molly and Daniel's neighbor, Rick, who is treated horribly by Daniel. I wish this book were easier for me to describe but with all the overthinking of the two women characters, I often felt overwhelmed reading the story. Which brings me to why I probably enjoyed the side characters more than the main characters...the side characters weren't bogged down by the overthinking, run on thoughts, of the main characters. Forget You Know Me is the first book I've read by Jessica Strawser and I really enjoyed it, but fair warning - this book is a domestic drama! I would not call this a mystery per say, and definitely not a thriller. What it's about: Molly and Liza used to be the best of friends but have grown apart since Liza moved away to Chicago. They decide to catch up on a video chat one night, and Liza sees something disturbing after Molly goes to check on her daughter... She ends up driving through the night to check on Molly, only to receive a not-so-warm welcome and basically gets the door slammed in her face. But Liza is troubled by what she saw, and even though the friendship seems to now quite possibly be over, she still wants to help. There is more going on with Molly than Liza knows, and everything will eventually come to a head in this sizzling domestic drama! I felt like I read Forget You Know Me really quickly, but when I looked at my stats on the Bookly app, I found out that it actually took me 6.5 hours! I don't know why it took me so long because I really do think this book is a fast read. Strawser's writing flows really well, and I was completely invested in the story. Luckily for me, I had not read the synopsis recently and went in blind. I had kind of thought the book would be more of a mystery, but domestic drama is a much better category for this one. The book made me tear up at the end and I loved how Strawser pulled everything together. She leaves you with a nice ending that is hopeful and sweet. Final Thought: I really enjoyed Forget You Know Me and I'm pretty surprised by the low average on Goodreads. I think it might have something to do with people thinking this is going to be a mystery, but it really isn't. I would recommend this to fans of domestic dramas and general adult fiction. I loved Strawser's writing and I can't wait to check out more from her! Molly and Liza have been friends forever--seeing each other through high school, college, and early adulthood. But they now find themselves drifting apart. Liza is single and recently moved from Cincinnati to Chicago. Molly still lives in Cincy, is married to Daniel and has two kids, ages three and five. One night they attempt to reconnect over video chat. But while Molly's upstairs putting one of the kids back to bed, Liza spots a black-clad figure sneaking in Molly's back door. Liza's shouting Molly and Liza have been friends forever--seeing each other through high school, college, and early adulthood. But they now find themselves drifting apart. Liza is single and recently moved from Cincinnati to Chicago. Molly still lives in Cincy, is married to Daniel and has two kids, ages three and five. One night they attempt to reconnect over video chat. But while Molly's upstairs putting one of the kids back to bed, Liza spots a black-clad figure sneaking in Molly's back door. Liza's shouting over the computer startles him, and he shuts the computer lid on her. Liza panics and calls the police. But she never hears from Molly again that night, beyond a few short texts. Convinced her friend is in real trouble, Liza drives from Chicago to check on her, only to have the door basically be shut in her face. Liza is baffled, wondering if their friendship is truly over. And Molly is unable to deal with what happened--and with the other issues going on her life. But the webcam incident has kicked off a series of events for both women that they soon will be unable to ignore. I have to hand it to Jessica Strawser--not sure what's happened to her in her life (ha), but she can come up with some tangled plots. As always with her books, you have to go in expecting more women's fiction than suspense/thriller, and that helps set expectations up front. Still, I have to say, that there are a surprising number of suspects for the black-clad figure who pops up on Liza's web cam. For a suburban neighborhood, it sure is a tangled web of secrets and lies out there! So I found the plot on this one kind of baffling at first: I think it could have done without Liza and Molly's fight, honestly. Their fighting was awkward and uncomfortable and didn't seem really necessary. But I quickly warmed to Molly and Liza, who were very real characters with flaws and genuine traits. For Liza, much of her life is ruled by her anxiety, while Molly's by her chronic pain. I felt for both of them. Despite being best friends, they are on separate tracks for most of the book, making you wonder where things are going to wind up. With everyone keeping secrets, telling lies, and basically just being dishonest--both to others and themselves--the book really does keep you guessing about what happened that night. As it does, you're treated to a very realistic look at marriage and friendship. I felt parts of it were overblown and it was a very different sort of read, but I enjoyed it overall. The descriptions and portrayals of Molly and Liza are what really drew me in. 3.5+ stars. I received a copy of this book from the publisher in return for an unbiased review- thank you! Thanks to St. Martin’s for a gifted copy of Forget You Know Me by Jessica Strawser. I am glad a skimmed a couple of reviews for this one before I read it. While there is tension, I wouldn’t call it a thriller. Liza and Molly have been best friends since they were kids. As they have grown up and live in different states, their relationship has become a little strained. The book opens up with Liza and Molly on Skype, trying their best to catch up. One of Molly’s kids gets out of bed during the call Thanks to St. Martin’s for a gifted copy of Forget You Know Me by Jessica Strawser. I am glad a skimmed a couple of reviews for this one before I read it. While there is tension, I wouldn’t call it a thriller. The book opens up with Liza and Molly on Skype, trying their best to catch up. One of Molly’s kids gets out of bed during the call and she has to go upstairs to put her back to bed. While Liza waits for her to come back she is shocked to see a man in all black and a ski mask enter the house. Unsure of what to do, Liza gets the guys attention and yells that she’s calling the police. When Molly gets downstairs she’s surprised to find the police at the door. She’s worried something happened to her husband while traveling but she’s told they had a call for a break in. Meanwhile, Liza is worried sick! Molly will not answer her phone but simply texts back she’s going to bed. What an opening right? Who was the man entering the house? And, how terrifying would it to be Liza? Sitting there helpless in another state. This is my second Jessica Strawser novel and I've enjoyed them both. Two best friends, Molly and Liza are on skype having a girls night (they live in two different cites). While Molly leaves the room to check on her child, Liza sees an intruder in a mask entering the house. Liza calls the police and then after not hearing from her friend, gets in her car with a close friend of hers and drives to Molly's home where she receives a rather cold reception. This book is really about relationships - bet This is my second Jessica Strawser novel and I've enjoyed them both. Two best friends, Molly and Liza are on skype having a girls night (they live in two different cites). While Molly leaves the room to check on her child, Liza sees an intruder in a mask entering the house. Liza calls the police and then after not hearing from her friend, gets in her car with a close friend of hers and drives to Molly's home where she receives a rather cold reception. This book is really about relationships - between the two friends, between husband and wife - and the interactions that make all the difference in the world. I found it interesting and the plot was a good one. I liked the characters and the writing style. I have read and liked all of Jessica Strawser’s books, with my favorite being “Not That I Could Tell.” “Forget You Know Me” is advertised as a psychological thriller, and it certainly fulfilled that description at the beginning. After that, the book changed course and focused primarily on the relationship between Molly and Liza. The suspense took a back seat to the issues in their friendship and resulted in what seemed to be a somewhat disjointed novel, or at least not the thriller I was expecting. It was an enjoyable read but I wish the two genre styles could have been more integrated or that the book had been advertised as women’s fiction with an edge. Not a bad book, just not what I was expecting based on the book blurb and on Strawser’s previous books. Jessica Strawser is the Editor-at-Large for Writer’s Digest magazine, where she served as editorial director for nearly a decade. Her debut novel, ALMOST MISSED YOU (St. Martin's Press), was a Barnes & Noble Best New Fiction Selection upon its March 2017 release, as well as a She Reads Book Club Selection and a PopSugar Best Spring Read. Her second, NOT THAT I COULD TELL, was a bestselling Boo Jessica Strawser is the Editor-at-Large for Writer’s Digest magazine, where she served as editorial director for nearly a decade. Her debut novel, ALMOST MISSED YOU (St. Martin's Press), was a Barnes & Noble Best New Fiction Selection upon its March 2017 release, as well as a She Reads Book Club Selection and a PopSugar Best Spring Read. Her second, NOT THAT I COULD TELL, was a bestselling Book of the Month selection for March 2018, and is now new in paperback and available at Target stores nationwide, with a bonus Reading Group Gold guide included.